Pesto is fantastic to have on hand for pasta sauce, as a really flavoursome addition to sandwiches or breakfast eggs or soups, or as a way to amp up roasted vegetables or meat. 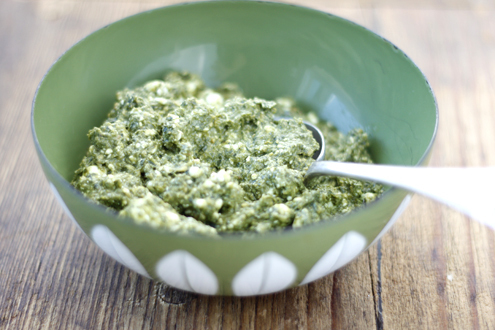 This gestational diabetes friendly Creamy Pesto is quick to make and will keep for several weeks in an airtight jar if you save adding the cottage cheese until just before serving. Blend all ingredients (except cottage cheese) with a hand-held blender or in a kitchen whiz until smooth. The pesto will keep for several weeks topped with oil and sealed in a small airtight jar or container. To make fresh creamy pesto, stir cottage cheese through the pesto at the last minute before adding to a dish or serving. Post-GDM suggestion: Replace cottage cheese with a light ric0tta cheese.